Bose has always brought excellent noise-canceling technology to its headphones, but with the disadvantage that they were previously only wired. The new QuietComfort 35 changes that. Bose has dispensed with the cable between phone and headset, using Bluetooth, instead. We tried the Bluetooth headset from Bose to see how it compared to its wired counterparts. Bose has been known since 2008 for headphones with very effective outside noise reduction. The noise-canceling system from Bose filters out constant noise – such as from airplanes, cars and trains – so effectively that it has proved very popular with frequent travelers. The experience gathered by Bose comes from professional fields such as headphones for pilots. Bose’s previous headphones with NC properties all relied on an analog connection. With the new QuietComfort 35, Bose enters the market of high-end NC Bluetooth headsets. As usual for Bose, the new QuietComfort 35 does not come cheap. $349.95 is the RRP, putting it $50 over the wired QC 25 model. In addition to the inconspicuous black, the QC 35 is also available in silver-gray. When it comes to designing headphones, there isn't much leeway once the manufacturer has decided on the wearing style. In addition to the discreet in-ear variants, there on-ear and over-ear versions. The Bose QuietComfort 35 is of the over-ear variety. What this means is that the ear cups cover the ear entirely, and the padding does not rest on, but around the ears. These Bose headphones are covered with leather and are comfortable even after hours of wearing them. Only on very hot days might they become uncomfortably hot on the ears, because the headphones are closed and allow in very little air. A small disadvantage, but you have to accept this level of noise-cancellation. The headband of the QC 35 is covered along the top with leather and wrapped about the bottom with alcantara. The remaining material looks at first and even second glance like plastic, but it is not. Bose has enveloped its premium headphones in fiberglass-reinforced nylon. This material has the lightness of plastic, but it is more robust and durable. Since the QuietComfort 35 is foldable for travelling, and therefore the joints are a weak spot, Bose has reinforced these points with stainless steel. All audio controls are found on the right headphone. There is an on-off switch, which is also used by the QC 35 to put it in Bluetooth pairing mode. The volume and operation of the music and phone calls is all done through three buttons placed at the bottom of the right headphone. The top and bottom buttons are only to adjust the volume, while the center button performs multiple functions. Press once to play and pause for music or to accept and end calls. A quick double press skips forward, and a triple press skips backwards. There are two options for pairing the headset with your smartphone: the classic Bluetooth approach or the NFC route. The latter naturally requires a smartphone with an NFC chip and is the most convenient way to connect. Enable NFC and hold the smartphone against the Bose QuiteComfort 35, where the NFC logo is, and the two devices are connected. If you don’t have an NFC-enabled smartphone, then the QC35 can be paired by using the switch on the side of the right headphone. Once that is done, the headset will be detectable to the smartphone or tablet and can be connected. Bose has provided the QuietComfort 35 with a companion app, available for iOS and Android. The app lets you configure your spoken language. The available languages include English, German, French, Spanish, Italian, Portuguese, Korean, Japanese and Mandarin. 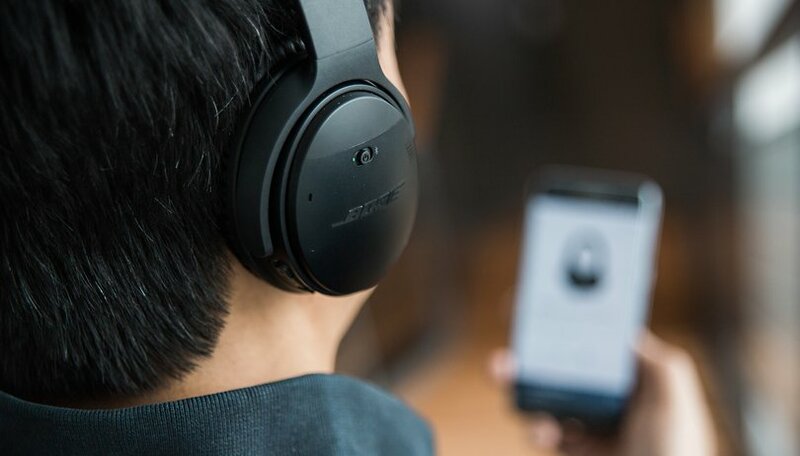 In addition, the app lets you assign a name to your Bose headphones, check the list of devices previously to have been connected with the headset and update the firmware. The latter may include new features, bug fixes or enhancements. Personally, I would have liked to have been able to adjust the sound via an equalizer, but who knows, perhaps this feature will come with a later update. If you’re looking for very bass-heavy headphones, then the Bose QC35 are probably not for you. The audio on the QC35 is more balanced or neutral, so it can be adjusted, within the limits of the hardware, to suit the listener’s taste using an equalizer. Anyone who owns a smartphone which supports the aptX codec can rejoice, for the Bose QuietComfort 35 supports the now more than 30 year old and almost forgotten codec. In fact, this algorithm, a creation of Dr. Stephen Smyth designed for the change from analogue to digital telephones (ISDN), has been used to improve voice quality. Normally, during the compression of audio signals, there is a significant loss of quality, but with the aptX codec, the audio signal after decompression loses virtually nothing. A complete overview of aptX-enabled smartphones can be found over at aptX.com. Overall, however, the audio is not balanced enough. Whether used via Bluetooth, with activated noise-canceling, or wired (which allows you to switch off NC) the mids are a little strong. The bass and treble are, in contrast to the mids, pushed into the background somewhat. Classical music, I found, lacks clear highs and R&B and hip hop are missing something on the bass end. With noise-canceling activated, constant ambient noise such as the hum of an aircraft, is effectively filtered out by the Bose system. But it is not perfect. Abrupt sounds, like people talking, children suddenly screaming or a car horn, are not completely filtered out. These acoustic spikes are dampened, but they still get through. In a way, this is good, because otherwise there is a risk of being unaware of your surroundings, which could potentially be dangerous, but if you’re looking for complete isolation, the QC35 will not provide it. One small drawback: If the QC35 runs out of juice and you connect the analog cable, then the microphone in the headset cannot be used, and you have to use the one found on your smartphone. With the QC35, Bose dares not only to step away from analog cables, but also bid goodbye to the AAA batteries of its predecessors such as the QC25. The QuietComfort 35 houses a permanent lithium-ion battery, which, according to Bose, provides 20 hours of wireless and up to 40 hours of wired listening. Our test proved that Bose has kept this 20-hour promise. Just a pity that you will have to factor in an almost 2-hour charge to get the battery to 100 percent. But you can always continue to use the headset without noise cancelling via the cable. The Bose QuietComfort 35 is aimed at a very specific group of users. These are looking for a Bluetooth headset with effective noise-canceling. These two criteria come before sound quality, which can be read in the overemphasized mids. When comparing this headset with its wired alternative, the QC25, the latter clearly sounded better. So you have to decide: either the wired QC25, which is $50 cheaper, or the wireless QC35 with slight sound deficits. There is also another criterion that comes into play: what smartphone are you likely to use in the future? If it’s a Moto Z or even an iPhone 7, then, the QC35 is the better choice, thanks to the Bluetooth technology. By 2017, more smartphone manufacturers will have turned their backs on the good old 3.5 mm headphone jack. The QuietComfort 35 is therefore a better investment if you’re looking for a noise-cancelling headset with a long lifespan. I think this wireless headphones deserve to have the term ‘Comfort’ in the name. Such comfortable headphones due to the premium materials. Im a bit disappointed as they are not compatible with my Sony (android) smart tv; apparently the bluetooth codecs are different. Anyone know a workaround? Such nice heaphones.. but that pricetag? Just too much money for me personally. But I wouldnt go without BT anymore, it obviously has its downsides, but too many advantages..
Who the heck would actually spend that much money on headphones? I'm perfectly happy with my 50 bucks headphones, good sound, decent quality, no BT but whatever... couldnt care less.